The capacity of RNA viruses to produce prodigious numbers of mutations is a powerful advantage. But remember that selection and survival must balance genetic fidelity and mutation rate. Many mutations are not compatible with viral replication. Consequently, if mutation rates are high, at some point accumulating base changes lead to lethal mutagenesis – the population is driven to extinction. The error threshold is a mathematical measurement of the genetic information that must be maintained to ensure survival of the population. The results of experiments clearly show that RNA viruses evolve close to their error threshold. The first clues that viruses exist on the edge came from studies in which cells infected with the RNA viruses poliovirus and vesicular stomatitis virus were treated with base analogs that act as mutagens. These compounds, such as 5-azacytidine, are incorporated into the growing RNA chain during replication, leading to incorporation of incorrect bases. Treatment of virus infected cells with such drugs dramatically inhibits the production of new infectious virus particles, but stimulates mutagenesis of the viral RNA by only 2- or 3-fold. When the same experiment is done with cells infected with a DNA virus, the mutation frequency increases by several orders of magnitude. A direct demonstration of error catastrophe was achieved by treating poliovirus-infected cells with the mutagen ribavirin. Treatment with a concentration of ribavirin that causes a 9.7-fold increase in mutagenesis lead to a 99.3% loss in poliovirus infectivity. A graph of the results shows that poliovirus exists at the edge of viability. 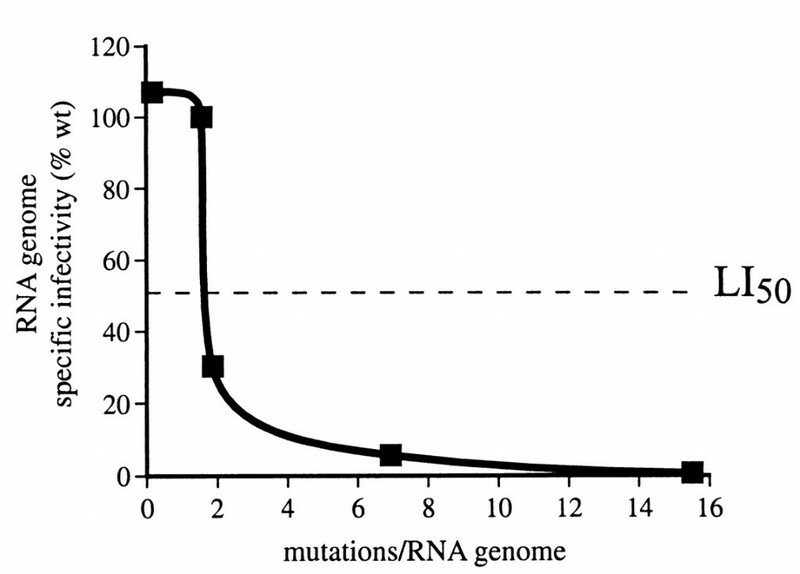 The line on the graph shows the infectivity of poliovirus RNA as a percentage of untreated viral RNA. The introduction of 2 mutations per genome reduces infectivity to about 30% of wild type RNA, while infectivity is nearly eliminated with 7 mutations per genome. Ribavirin pushes poliovirus beyond the error threshold because it causes the RNA polymerase to make more errors than it already does. What would be the property of a poliovirus mutant resistant to this drug? A poliovirus mutant resistant to ribavirin was selected by passing the virus in the presence of increasing concentrations of the drug. Resistance to ribavirin is caused by a single amino acid change, G64S, in the viral RNA-dependent RNA polymerase. RNA synthesis of ribavirin-resistant poliovirus is characterized by fewer errors, in the absence of drug, compared with the parental virus. Therefore the mechanism of resistance to the mutagen ribavirin is achieved through an amino acid changes that makes a viral RNA polymerase with greater fidelity. Now that we have an RNA polymerase that makes fewer errors, we can use it to limit viral diversity and test the theory that viral populations, not individual mutants, are the target of selection. Where did this G64S mutant come from? was it just a product of the natural process you've been talking about? “Now that we have an RNA polymerase that makes fewer errors, we can use it to limit viral diversity and test the theory that viral populations, not individual mutants, are the target of selection.” Wow, has this been done? The G64S mutant was selected by growing virus in the presence of ribavirin. The drug selects for pre-existing mutants in the quasispecies. So yes, it's a product of the natural process I've been writing about. Tomorrow I'll write about how this mutant was used to test the theory. Yes, it's been done. Does the history of viral mutagens mirror those of the animal and bacterial worlds. At first we didn't have the wonderful compounds to speed up the mutation rate and we had to have poor graduate students look for mutation at the normal rate? I know that in Drosophila there was a time when you would do an F1, F2, etc crosses and continue to look for the deviation from the wild type until you found your mutant. Then mutagens like UV light, x-rays, drugs, etc were used to greatly speed these processes up. Likewise, do virologists use high energy photons to mutate viruses or does that not work so well? It seems like you could blast a plaque, once you have one, with x-rays and get viral mutants. Of course if you blast a viral infected cell culture with x-rays you might get some other results because of the damage to the host cell genome. Also, can ribavirin be used as an antiviral and are there other drugs that could be used as an antiviral that would modify rna dependent polymerase activity? It seems like there could be nonspecific interference with the host cell rna polymerase if you were to administer ribavirin to humans. I guess the trick would be to find drugs that would cause rna modifications to only those rna’s made by rna depdent polymerase. That may not be possible since one rna looks like the other. is there also a threshold for synonymous mutations ? Your last comment is puzzling to me. The unit of selection is individual mutants, at the very least. To Corey, ribavirin is used clinically (http://en.wikipedia.org/wiki/Ribavirin). To gsgs, I don't see why there wouldn't be a synonymous mutation threshold given that the hosts have codon biases. you need to do is devise a selection scheme. only in cells infected with the virus. of selection. The target for selection is the entire population. Are there substances found naturally that act like ribavirin, pushing up the number of mutations per genome? So today in the NYTimes, the story about the assistant principle who died of swine flu said he had been given “the experimental drug” ribavirin. This must be the same stuff you are talking about here, right? So the thinking about how it would work is that it pushes the virus over the error threshold once an infection has started? way with influenza, but it hasn't been looked at. ..Does anyone know of a reference for this? ?